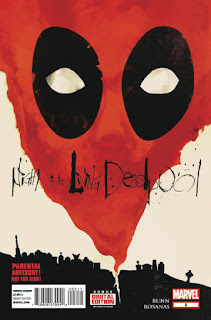 A zombie apocalypse occurs, leaving the mercenary Deadpool the last remaining superhuman. In the second chapter, Deadpool and the group of survivors he’s leading spend about eight weeks traveling and seeking shelter, visiting Ash Williams’ cabin (from The Evil Dead), Hershel Greene’s farm and the West Georgia Correctional Facility (The Walking Dead), the Monroeville Mall (Dawn of the Dead), the Pacific Playland Amusement Park (Zombieland), and the Winchester Pub (Shaun of the Dead). Obviously, this one is an AU. This is apparently NOT the same universe as the Marvel Zombies series. I know Evil Dead is in the CU. On some post you mentioned that The Walking Dead TV series an AU. Presumably, the other mentions films are also AUs. Even Shaun of the Dead, where the zombie out brake was stopped, couldn't be in the CU.